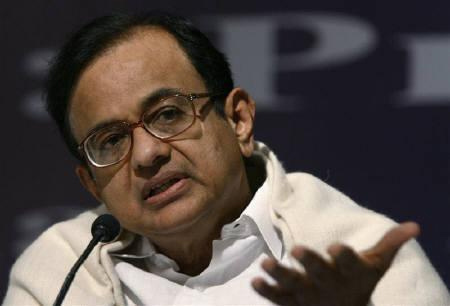 The empowered group of ministers (EGoM) on telecom headed by Finance Minister P Chidambaram on Monday decided to impose a one-time fee on incumbent operators prospectively for spectrum beyond 4.4 MHz in GSM and 2.5 MHz in CDMA. As a result, telecom companies, including Bharat Sanchar Nigam Ltd, Bharti Airtel, Vodafone, Idea Cellular and Reliance Communications and others, will have to fork out Rs 27,517 crore to the government. The cut-off date for calculating the fee will be the one on which the Cabinet clears the EGoM decision. The Cabinet is expected to take a final decision by October 16, well before the last date for submission of bids by prospective operators for the 2G spectrum auction. 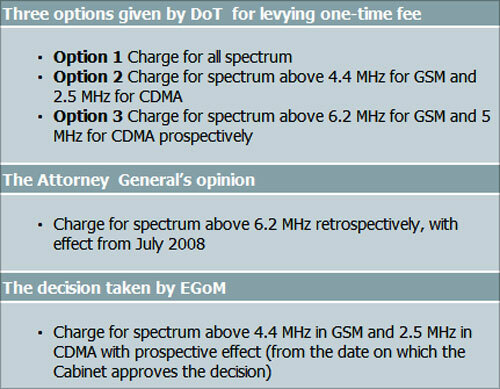 The decision is a rejection of the opinion of the Attorney General of India, who had said a one-time charge should be levied on spectrum beyond 6.2 MHz but retrospectively from July 2008. Image: Finance Minister P Chidambaram. He had also responded in the negative to a query from the EGoM as to whether a one-time spectrum charge could be levied prospectively for zero spectrum to 4.4 MHz or to 6.2 MHz to bring about a level playing field. The ministerial group decided that operators who did not wish to pay a one-time charge for spectrum beyond 4.4 MHz could surrender it. Based on an analysis by the Cellular Operators' Association of India (COAI), the top five GSM operators, BSNL, Bharti, Vodafone, Idea and Aircel, would have to fork out Rs 17,166 crore while for the entire GSM industry the burden would be Rs 18,000 crore. 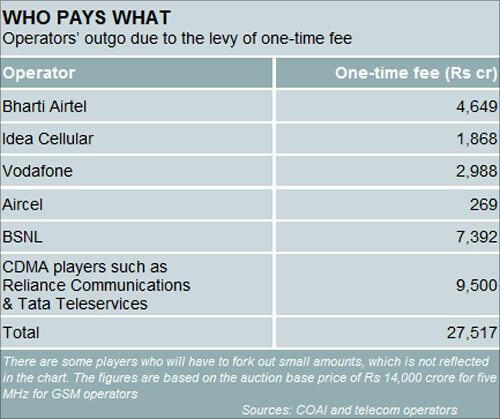 The calculations are based on the spectrum auction base price of Rs 14,000 crore for five MHz. Ironically, the bulk of the brunt will be borne by the state-owned BSNL, which despite its financial state and falling market share would have to fork out nearly 40 per cent of the total amount GSM operators would have to pay. 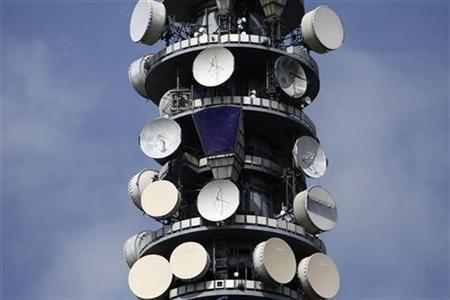 In the CDMA space, according to rough calculations by operators, Reliance Communications, which has spectrum beyond 2.5 MHz in all circles except five, and Tata Teleservices, which has spectrum in 11 circles beyond the limit, will have to together fork out less than Rs 10,000 crore. The EGoM also took a decision to refund the licence fee of Rs 1,658 crore paid by operators whose licences got quashed recently by a Supreme Court order in case they did not win in the 2G auction. If they win, the amount will be adjusted with what they pay for auctioned spectrum. The group also cleared a deferred payment schedule for spectrum, entailing 33 per cent upfront payment for GSM and 25 per cent for CDMA. However, there will be a moratorium of two years if the balance licence period is greater than 15 years, one year if it is between 10 and 15 years and none if the balance is less than 10 years. The operators, while not elated, are relieved as it could have been worse if a proposal to charge retrospectively was cleared. Says COAI Director General Rajan Matthew, "It could have been worse, of course. But it will adversely impact the telcos' rate of return. We might have no option but to go to the TDSAT unless the government gives us some concessions when they give us unified licences." That might be the official line but incumbent GSM operators privately admit it has come as a big relief. "The dual technology operators now have to pay the same as most of us. The staggered payment scheme has reduced the upfront burden," says a director in a telecom company. AUSPI, which represents dual technology players, was disappointed. Ashok Sud, the secretary general, said, "Our stand was the government should charge a one-time fee only beyond 6.2 MHz. We now have to see what our members want to do." Special: Is the telecom sector's party over?